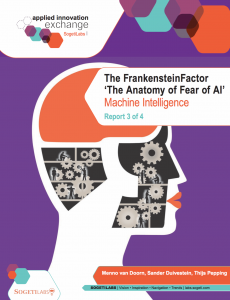 The most recent SogetiLabs report, The Frankenstein Factor, is about the fear for Artificial Intelligence (A.I.). A fascinating read which made me think about how I personally relate to A.I. And how I relate to the increasing impact of technology on our world and society. I used to be very optimistic. When social media like Twitter started, about ten years ago, I had a lot of discussions with colleagues and friends. I saw huge possibilities to connect people around the globe, to be informed and educated. To have people understand each other better and cooperate. I behaved as a social media evangelist. And all those things indeed happened, but at the same time social media lead to a huge amount of rubbish, fake news and polarization. One of the results is that people are in a bubble. They only read things within their own bubble. This is exactly the opposite I hoped for and expected. I didn’t see it coming. Now, ten years later, technological changes are huge. We cannot even imagine the impact it will have. Artificial Intelligence, Internet of Things, Chatbots, Blockchain etc etc. We are not in an era of change but in a change of era. 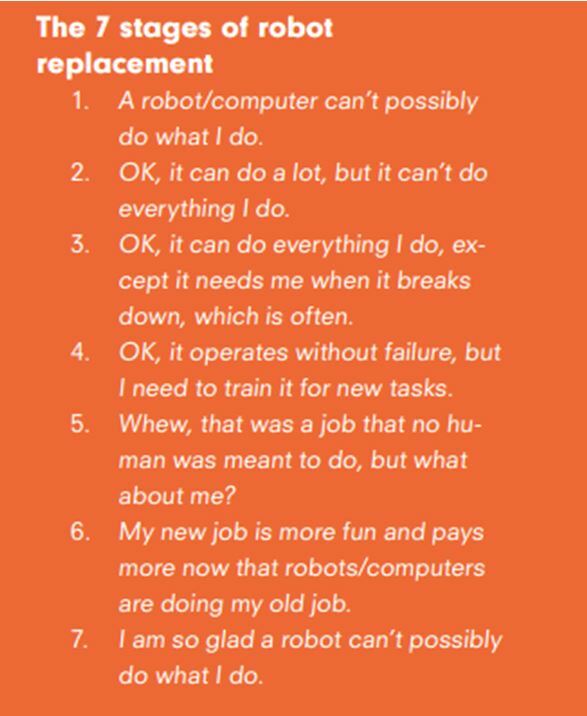 The fourth one, the need to be needed, relates to the fact that technology tends to take jobs. There is no doubt it does and will keep doing that. But is that bad? I don’t think so. A.I. will definitely take over repetitive tasks. But people were never made to do that anyway. What will remain are the tasks for which typical human talents are needed. Creativity, taking care of each other, human empathy, keeping each other company, coaching, giving guidance. Every human being will be needed, not to do administration but to be a social human being. That’s progress, I would say. What a great article André Helderman ! As you probably are, I’m optimistic, by design. I think we, human being, are globally improving. The seven stages people go through is very pertinent. I have one question, related to the 6th one. Let’s remember the coal mine and the millions of workers. What was their day-to-day after they got fired? Were all of them retrained for other business? Since the majority of the jobs are today either repetitive tasks or humanly senseless, I think robots and AI will be overpassing the business landscape. We will have people without bankable jobs, in each and every sector. My concern resides on the double challenge our future society will face out. 2-	Sociologically: No more plenty days of hard work that mobilize 100% of their brain CPU. With more free time, majority of the people will have by default, time to ask themselves about the real meaning of their life. People will individually have to be closer to themselves to find their own sense of life, their own path. Like all the time since Stone Age, Diversity and Culture will succeed. Through cultural activities, we’ll get wellness and happiness for more people on earth. Thanks for your comment Kamel. Your question about “the day after the coalmines closed” is indeed interesting, and a bit confronting! I don’t have the figures but I am pretty sure many of the people did NOT succeed in finding new jobs. And nowadays we are all potential future “coal miners”. – Flexibility is key. The ability to adjust is even more important than specific knowledge or skills. 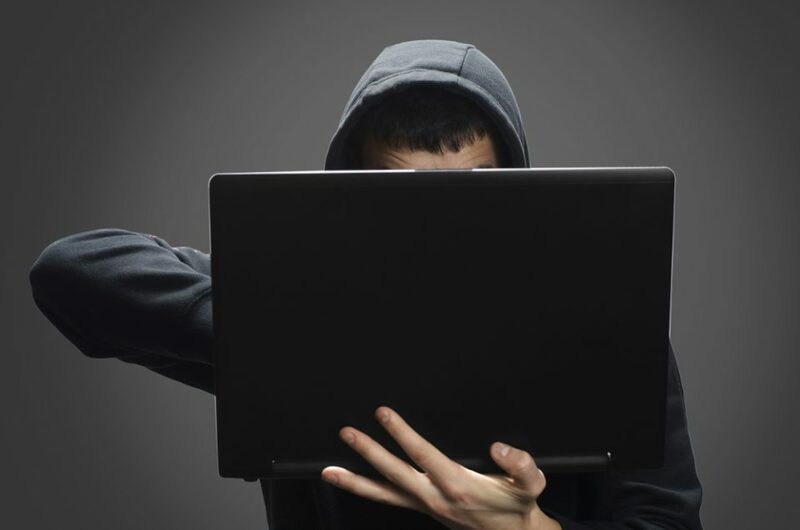 Survival of the fittest; digital darwinism. Thinks like “lifetime learning” are directly related to this. Kids should be educated to be flexible and find their way in an ever changing environment. – But even then, not everyone will be capable to keep adjusting; there will not be valuable work for everyone at any time. Therefore I think we need to figure out a new system of work and payment. The discussions about a “basic income” relates to that which I find a very interesting concept. The “need to be needed” however is a key item in that discussion.